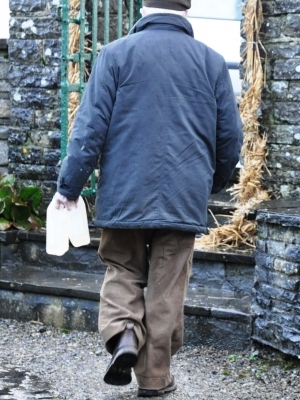 A woman collecting holy water at St Gobnait’s holy well, Ballyvourney, on 11 Feb 2013, St Gobnait’s Day. Visits to holy wells are a main part of my research. I usually leave with notes, audio recordings, video and photos, but also, frequently, a bottle of well water. 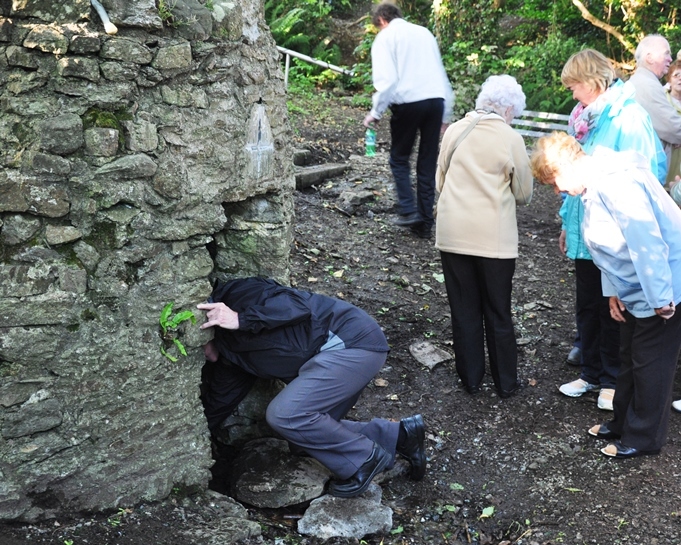 In regards to the latter take-home, I am participating in one of the main activities of the holy well. 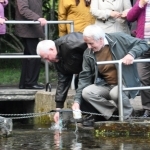 People come to collected the holy water from the well, usually on the main feast day, to bring home or to carry to relations, friends and neighbours. The water is mainly used as a blessings, invoking protection for the house and visitors, recovery from illness or warding off evil. 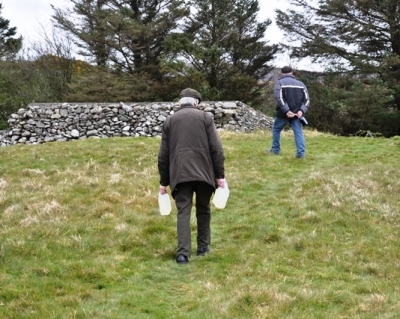 Some wells are associated with specific cures or purposes; for example, the water from the City is used to bless crops and livestock in early May, while the water from Tobarín Súl near Lough Eyne is used for tooth aches. This transfer of water is a form of mobility. Wells are necessarily located. It is at the exact point where the water surfaces, transforming from a subterranean substance to a grounded, earthly form, that it is held to be potent. It must be accessed at the source, for the very same water is not collected when it flows away to a stream or elsewhere. However, the forces and qualities of the well are mobile, through and in the water. Essences of the well, the saintly or supernatural can be brought to homes where it is stored and applied as required or as tradition sets out. While the well remains fixed, it is also highly mobile. 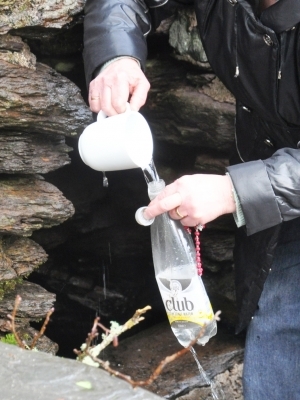 An audio clip of me collecting water from the well at the City near Rathmore on May Day, 2013. 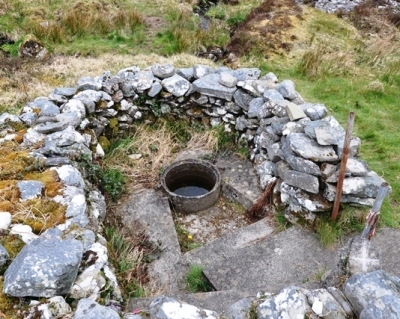 While holy wells can be found across Ireland, each one as a unique character. The physical location, site features, number of visitors, votive offerings, origins, saintly or supernatural associations and numerous other elements all combine to make each spot distinct. To this we can add the context of the visit – the time (both in a day and seasonally), the purpose, whether we are alone or with others – and the meanings and emotions we, and others, bring to the site. 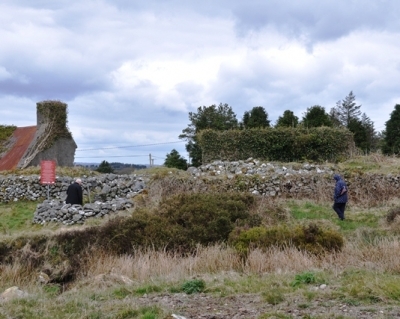 Ronan Foley (2011, p. 470) outlines how holy wells “range from literal holes in the ground to substantial landscaped sites with a mix of natural and culturally introduced elements. In general, the sites contain the wells themselves, streams, stone crosses and covers, paths, trees and bushes, altars and statues, all of which have physical form but wider symbolic meanings as well”. His description captures some of the variety that one finds materially at holy wells, while also hinting at how features combine to create each one. 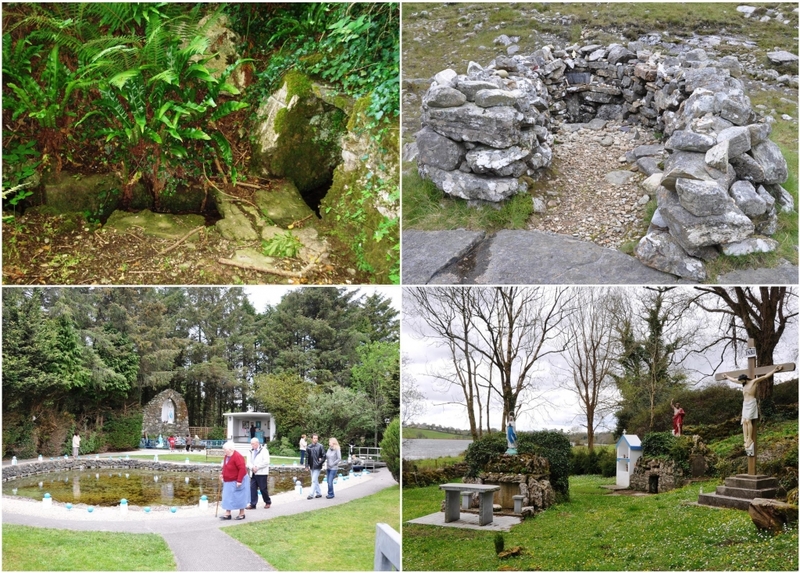 A selection of holy wells (clockwise, from top left): Sunday’s Well, Raffeen, Cork, a simple well in the hillside that is frequented by a small number of locals; St Patrick’s Well Mam Éan, Connemara, a well on a mountain pass surrounded by a walled enclosure with a collection of votive offerings; St John’s Well, Newhall, Clare, an enclosed well with an altar, several statues and a shrine, the site is visited on June 23rd, St John’s Eve; ‘Tubrid’, Millstreet, Cork, an elaborate well-site with a Marion Grotto, an sheltered altar, railings and a landscaped environment, an annual mass is celebrated on a Friday in May. 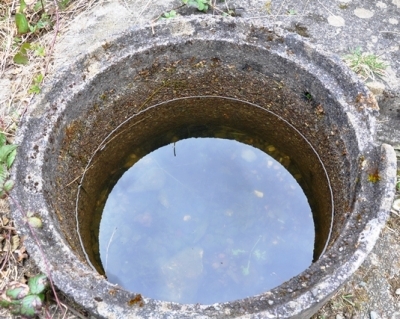 While it makes sense for any study of holy wells to engage with them both collectively and individually, that process should remain conscious of the uniqueness of each site and how that affects and shapes our understandings. Foley, R. 2011. 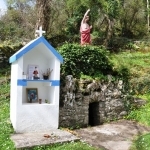 Performing Health in Place: The Holy Well as a Therapeutic Assemblage. Health & Place, 17, pp. 470-479. As part of UCC’s Doctoral Showcase – an annual event which encourages research students to develop innovative ways to communicate their research to non-specialists – I developed a short video which intends to convey a sense of place through the use of sound and images. I used a collection of audio recordings and photos from St Gobnait’s in Ballyvourney to make the video. 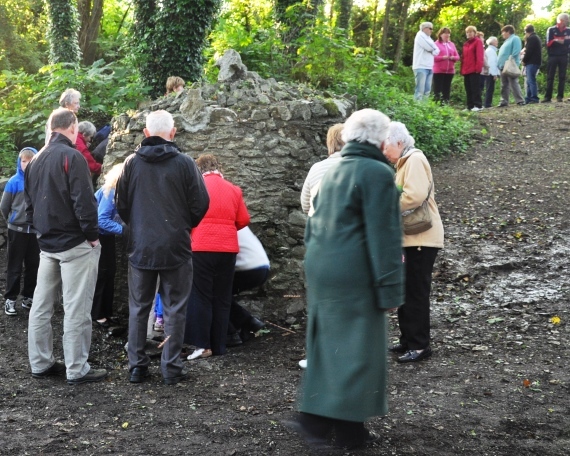 The showcase presentation also involved members of the audience engaging with the place tactily as well, through the distribution of rosary beads, stones form the site and water from the well; although this isn’t possible here, I feel the video still goes a long way to giving a solid glimpse at St Gobnait’s. The sounds in particular – feet crunching gravel, stone scrapping against stone, water dripping – evoke the place and what it is to be there. P.S. I’ve previously blogged on Podcasts & Place and many thanks to my cousin Eilín for narrating the video. 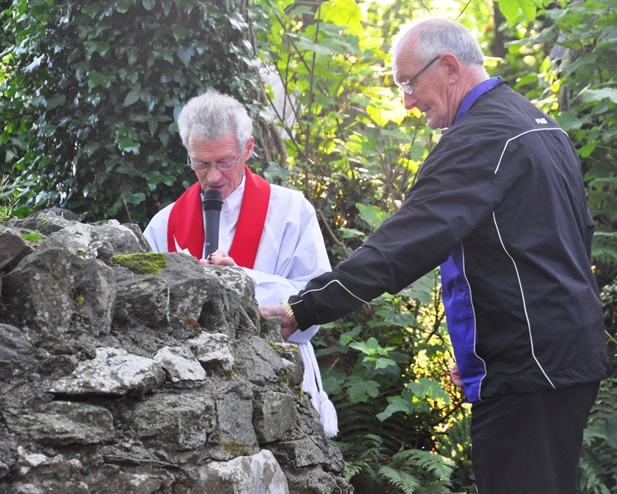 St John’s Well Carrigaline is venerated on St John’s Eve (23rd June) in a tradition that dates as far back as at least the early nineteenth century. The communal celebration of the well sees over a hundred locals gather for prayer and hymns at the site. 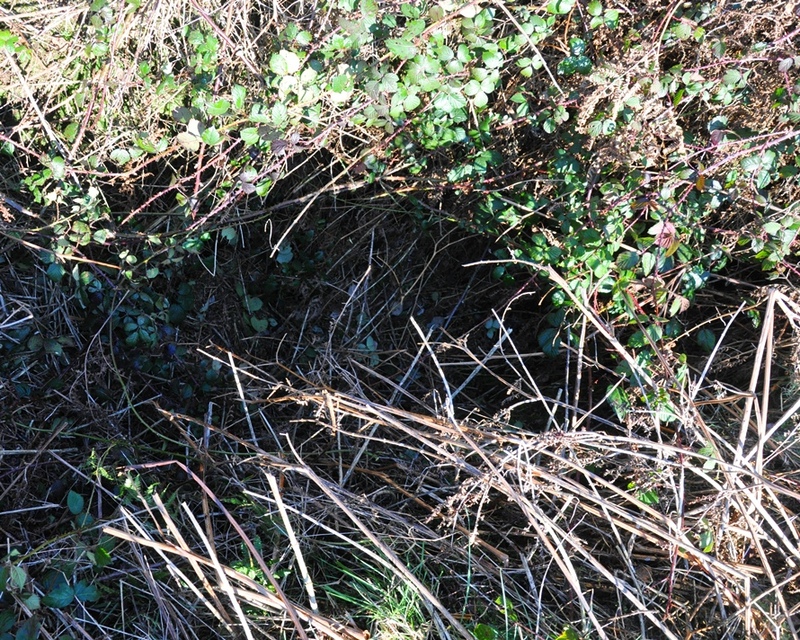 The well, also referred to as Tobar Eoin Óg or St Renogue (in a corrupted form), is located to the north-west of the main town, along a path between the Ballinrea Road and the Ballea Road (R613), adjacent to the Dun Eoin residential area. It is encased by a bee-hive shaped structure, with a small entrance from which water flows. A damaged cross tops the structure, while five pilgrim crosses are inscribed on the exterior walls. 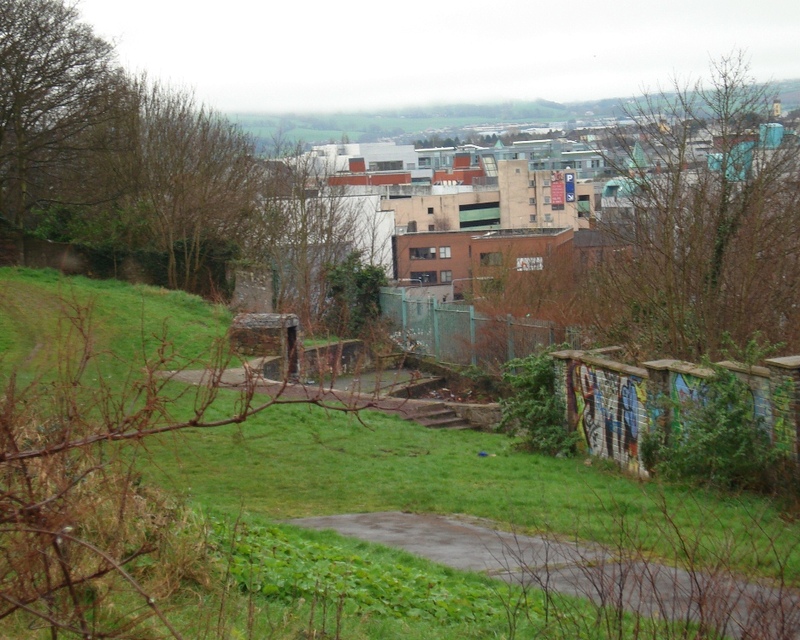 While a number of locals are very dedicated to the upkeep of the site, anti-social activities (a common feature of wells and other sites near towns) still make their presence felt. St John’s Eve is a traditional time of celebration. It is a mixture of the Summer Solstice, Pagan/Celtic customs and Christian/Catholic saintly devotion. The lighting of bonfires (large open air fires) was a prominent way of marking the occasion; this practice is still common in Cork city with both official community events and unofficial (sometimes dangerous) fires. 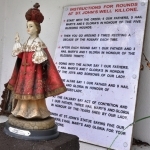 As part of the customs surrounding the night, wells and sites associated with St John are venerated. 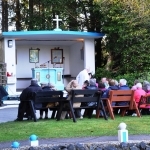 The current form of the devotions at St John’s Well are organised by a small group in conjunction with the Catholic parish clergy. The rosary is lead by a priest who circles the well, with someone inscribing crosses to mark each decade of the rosary. The Eucharist or Blessed Sacrament is displayed and venerated, while music is provided by members of the parish choir and the Carrigaline Pipe Band. After the formal service, some go to the well to drink the water, bless themselves and/or collect some to take way. 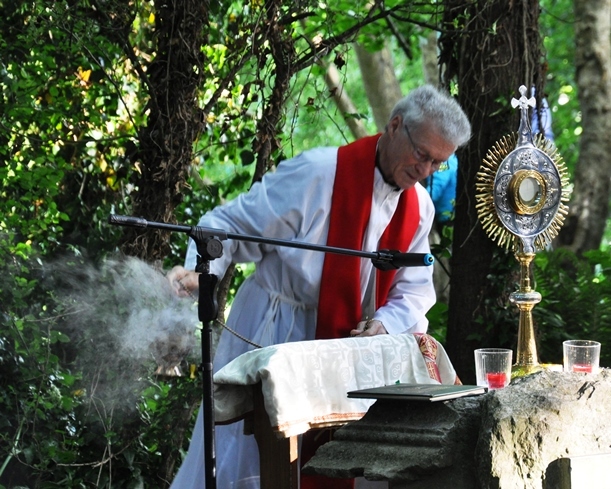 The Blessed Sacrament, or Eucharist, is incensed as part of the service. 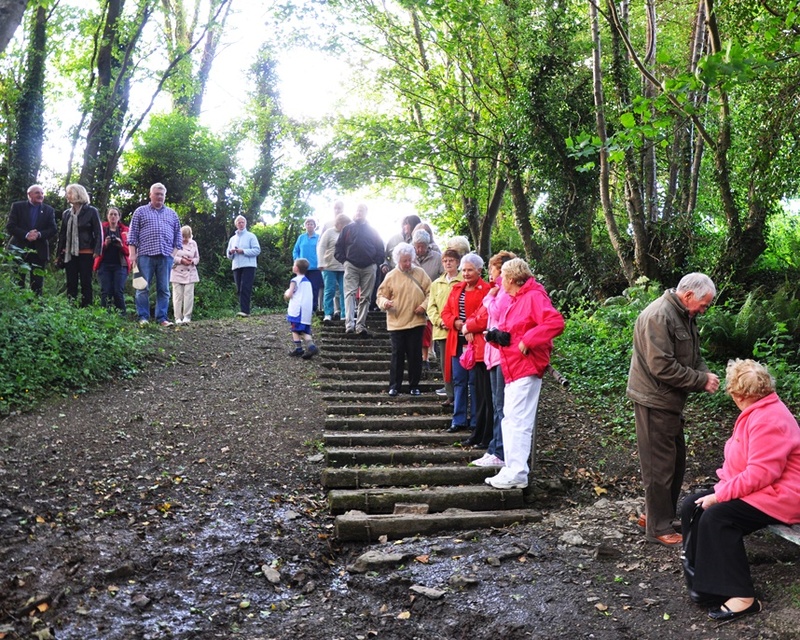 Pilgrims gathering around the well to collect water after the service. The structure requires pilgrims to reach right down into the well to gather water. While the format of the events see only one or two people doing the ’rounds’ during the service, a number of people individually circle the well, marking the crosses and praying. The structure over the well forces pilgrims to bend down and really get into the well if they are to access the water. The bodies and movements of the pilgrims, therefore, respond to the spaces in a particular way. Also, while a minority are content to bless themselves with the water as it flows from the well, many gather it from the well directly. This speaks to a firm continuation of faith in collecting, touching and drinking the water at the exact point of the source, where it is held to be purest. The organisation of and attendance at the 2013 service indicated a healthy belief in the well and the importance of continuing its veneration in this community. This is the third year in-a-row that I have attended this event and it has consistently attracted large crowds (although torrential rain last year resulted in a simplified service and a smaller crowd). Also, on this visit I meet Louise Nugent of the blog Pilgrimage in Medieval Ireland who has also written a post on the evening. 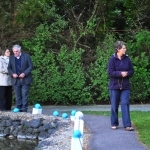 Carrigaline Catholic Parish website features information on the Well. 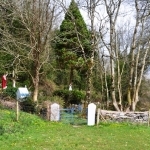 Tubrid Well is located on the western edge of Millstreet in north-west Cork: it lies north of the Killarney Road and is adjacent to the River Finnow. It is a developed local pilgrimage site with considerable individual and communal devotion practised, especially during May. The annual May mass holds a particular significance for the Catholic community of the area. It serves as an opportunity for communal worship. 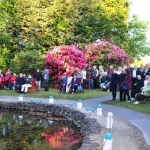 A crowd of over 200 gather on this occasion (31st May 2013), with a choir and pipe band adding to the event. The association with May, in modern times at least, centres on the Marian devotion at the site. The month of May is a special period of devotion to the Virgin Mary in Catholicism. On the evening of the mass (a particularly pleasant evening), the majority appeared to be there for the mass itself, as many people dispersed once it finished. 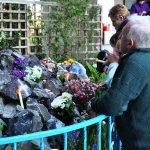 Those who remained stayed an chatted with neighbours and friends, numerous people drank and collecting water from the well, while others prayed and left votive offerings at the grotto and completed the rounds. Collecting and drinking water at the edge of the well. Doing the rounds at the site. Praying the rosary while circling the well. The site is well tended to and is highly structured, with the grotto dominating the space and different features directing movement. The well is actually a natural spring pond with water visibly bubbling up from beneath the surface. Paths shape the flow of visitors; there is a specific point to drink and gather the water; and, the low lying chain around the well marks out the prayers of the rosary. However, on this evening the mass took precedence for many over any other practice, while others performed their own rituals. The physical features, as well as the ability to drive right up to the entrance to the well, facilitate access, especially for elderly visitors and those with mobility concerns. 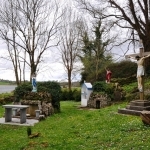 St. John’s Well, adjacent to the ruins of Killone Abbey, sits on the bank of Killone Lake. The well seems to have been linked to eye cures, being originally attributed to giving sight to a blind man. The main pattern day was 24th June; this would make sense as it is near the feast of St John (and the summer solstice). 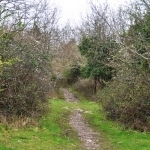 A old route from Ennis to the well, called the Rocky Road or the Pilgrim’s Road, was used by devotees – sections of it still remain. Approaching the well from the ruined monastery, It is nestled between the northern end of the lake and a wooded incline. You only notice the site when you are very close. Numerous features have been added to the site, including the statue of saint John over the well and the shrine for votives on the right. A statue of Our Lady adorns the old altar, to which a new altar has been added. A large crucifix is clearly dominant, as well. The site is very well tended to. The well with the votives shrine and some offerings. 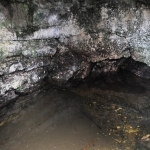 The distinct limestone of the region can be seen in the structure encasing the well. The interior of the well; the water level seem to be rather high. A guide to the rounds of the well are located in the shrine. One of the sections of the Rocky Road leading form the outskirts of Ennis. ‘The City’, or Cathair Crobh Dearg, is a local pilgrimage site in Shrone, Rathmore, Kerry, on the northern slopes of the Paps. The name ‘The City’ refers to the locations role as a cathair (ringfort). The surviving walls and features of the antiquity serve as setting for the pattern that is performed there. It is believed that this has been a place of continual devotion and worship over several millennia. Both the location and possibly a pagan deity were Christianised with the space being associated with St. Craobh Dearg ( a sister of St Gobnait of Ballyvourney). In a further pagan/Celtic connection, the pattern is performed on May Day, that is the feast of Bealtaine and it is linked with ensuring the health of cattle, or sometimes agriculture more generally. The Well is located on western side of the City. It is the last station on the pattern. It is enclosed by a stone wall with a small amount of votive offerings present. Some work was done in the recent past with the well being located within concrete piping, with surrounding steps which facilitate access. At the western station of the pattern, there is a statue of Our Lady with the Infant Jesus and a number of cross slabs. Devotees make the shape of the corss as part of the pattern. The deep groves speak to the age of this practice. The Well from the road, with a woman doing the rounds and a man at the well. A woman doing the rounds, circling the outside of the City. The flow of people that day has created a ‘path’ in the grass. The water is taken away on sprinkled on cattle or the land. It is also kept to give to sick cattle. Some people take several bottles of water, collecting it for their neighbours and friends. A recording of me collecting some water from the well. A video of me walking around the outside of the City, along the pattern route. The flow of earlier pilgrims has left a clear on the route. Lady’s Well is one of the few wells within Cork city. It is located north of the city centre, on the eastern slope of the small valley that leads out to Blackpool. It gave Lady’s Well Brewery, just below the well, its name, while what is now Leitrim Street was formerly called Lady’s Well Street. The well has had a varied modern history. 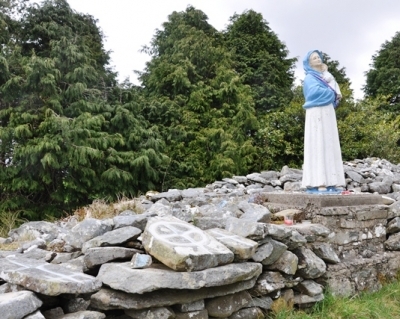 There seems to have been no record of religious activity on the site and by the 1980s no surface trace of the well existed, although the shrine to the Blessed Virgin Mary was on the site, which was demolished in the later 1990s. A City Council sponsored excavation in 2000 revealed a cast-iron basin surrounding by sandstone flags as being the likely earliest flooring at the well. At that time, the well and grotto were consolidated. I visited the site on 26th Feb 2012 and again on 24th Feb 2013. When I intended to blog about the site recently, I returned to get more recent photos. On my initial visit I found the site to be untidy and generally a bit run down – in particular, drinks cans allover the site and in the well. This poor state was one of the main motivations for revisiting the site, as it didn’t want to misrepresent its current condition. However, the site was in an even poorer state on my second visit. Messiness and evidence of drinking was compounded by neglect and vandalism. The photos below which compare the site over the two visits clearly illustrate the change, especially in terms of the well itself, which is now inaccessible as the basin is completely filled in with bits of broken paving. Although, the well is an acknowledged heritage feature and was renovated with community support, it seems to have slowly deteriorated. 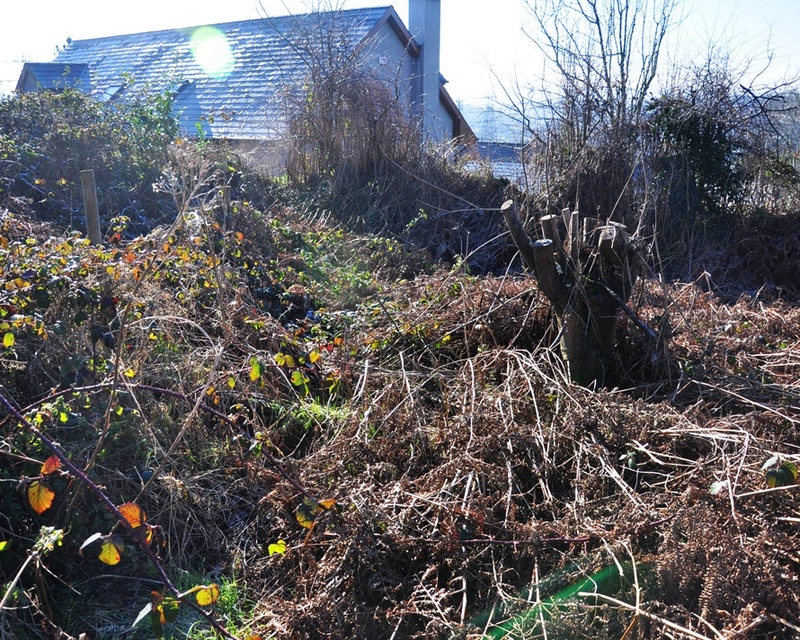 Its location on a secluded section of the hillside above the brewery but out of site of the houses above means its an ideal location for ‘anti-social’ behaviour, with evidence of drinking, vandalism and fire-lighting. I am slightly conflicted over what the visits have revealed. Firstly, it is a shame that one of the few examples of a holy well in the city is in this condition; and, as a result, I have contacted one of my local councilors about the issue, who will raise it at the City Council. However, this also presents a study in the decline of a holy well. 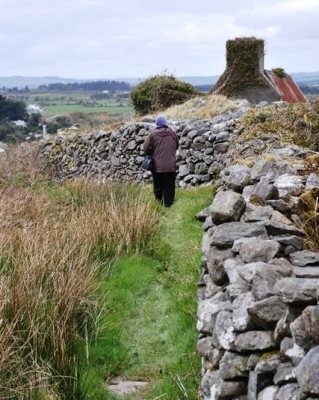 Many hundreds of the 3,000 holy wells that were believed to have existed across Ireland can no longer be found or have deteriorated beyond recognition. Although, intentional actions are involved here, the site is a metaphor for what has happened to so many sites. Wells which are no longer the focus of devotional activity can fall into disrepair and become unattractive, furthering their demise. It would seem the central reason for the survival of so many wells is the role of devoted people who frequent and upkeep them. While the physical structures and role of Lady’s Well in the nomenclature of the city ensure the site will remain in the future, what exact form this will take is uncertain. I shall return to the site and the topic. Two views, one from each visit, looking south at the site: it resembles a mini-amphitheatre, with a curved shape on one side and it is spread over three levels – a back support level with the ground behind it, a middle level with an empty grotto at the far end and the lower level which has the well at its centre. The well’s poor condition, marked by litter mainly, in Feb 2012 is replaced by one of complete disrepair in Feb 2013, presumably through intentional vandalism. The view of the site in Feb 2012 from the laneway between Richmond Hill and Leitrim Street. Part of research, in fact a large part, involves activities that are unsuccessful or at least not what you had hoped for. A trip to archives only turned up a book that was not what the title suggested, or an important interview is cut short or an event is cancelled. This is a necessary part of research The adventure and curiosity that drives research centres on the fact that you don’t know what you are going to get. But we can, of course, learn from these instances. This morning, a cool but sunny spring Sunday, I went in search of Toberbarry, a holy well, in Kilbarry just north of Cork city. The well, a spring in a depression, was linked with St Fin Barre’s first Church in Cork. Working off archaeological records, maps and google maps, I knew fairly accurately (within a few square metres) where the well was. 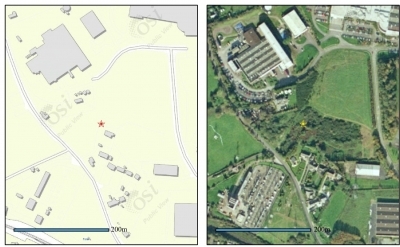 However, the site does not appear to be in use and it is located in overgrown rough land. Even with precise directions it was going to be a challenge. I was unsuccessful in finding the well. 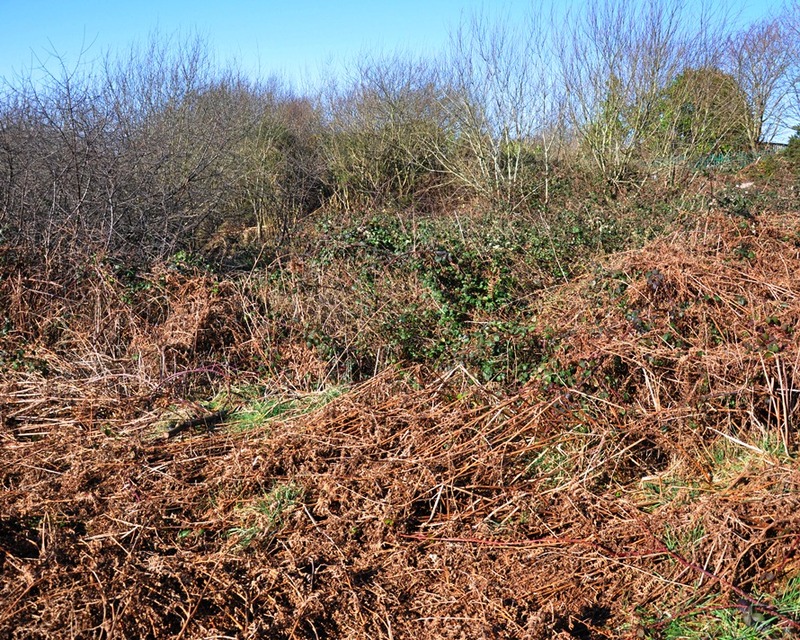 The search was challenging in that the area I needed to get to was beyond a large patch of brambles, which I had to work my way through, over and across with the assistance of a stick. The small area in which I estimated the well was located was less overgrown but it was still very difficult to make out surface features. I did come across a hollow or pit, which may potentially have been the well, but there was no sign of water. Despite not achieving my main objective I did photograph the site and record some thoughts, as well as being reminded that research involves interesting experiences in which you never know that you’ll find, or not find! Any future attempts to locate the well, or its remains, will be based on local knowledge. Timing didn’t allow knocking on a few doors, but maybe next time I can ask a few residents if they could offer assistance on the quest. The rough land I had to get through to the well site. The rough location of the well. A depression in the ground, a potential holy well.